For those who live in rural and regional NSW, small country towns are the beating hearts of each shire. If walls could speak, the stories of residents and villains, hatches, matches and dispatches, transactions and takeovers would fill volumes. However, the history of such places is rarely known let alone remembered except for the dedication of local historians. The signage of the Independent Grocers Association (IGA) is familiar across many small towns as they provide food retailing in rural areas yet, even they suffer the loss of revenue due to residents working and shopping in larger towns and so, the buildings are vacated, remaining empty and quiet for years. Such was the case with the old IGA building in Coolamon, a town in the middle of the Riverina. A decayed wooden entrance, rotting lino floors, a battalion of loose fluttering fluorescent lights and drooping ceilings could cause reverse gear in any but the bold and brave. Five years ago, Barry Lilywhite was chief cheese-maker at Charles Sturt University’s Wagga Wagga campus, creating award-winning cheeses; those containing native ingredients among the most popular. One ordinary day his life changed with the pronouncement the facility was closing – soon. A cheese-maker without a purpose is like a grain-grower without a tractor. And years roll by. However, Barry Lilywhite is a man of vision, grit and a wicked sense of humour and it wasn’t long before a plan started hatching with his son, Anton Green, who has years of experience managing international properties. ‘What if..?” became their favourite words and so commenced the journey of imagining then bringing to reality, the recently opened Coolamon Cheese Factory. The traditional method of raising capital is to seek money from a financial institution such as a bank; if the project meets criteria, the borrower gets the go-ahead. Alternatively, crowd funding is the practise of funding a venture by seeking monetary contributions from many people. With the aid of the internet, thousands can be reached to invest in ventures they believe in. Crowd funding is a disruptive platform appealing directly to individuals so they provide capital and emotional investment in a project. The crowd-funding for the Coolamon Cheese factory commenced in October 2014 and was over subscribed a month. The power of this system is the diversity of willing small investors. Investors from the Riverina, grants from the Murray Darling Basin Authority, Beyond Bank, Industry NSW and crowd funding has created a large community of commitment. In his welcoming speech, Barry Lilywhite explained “We sold them a dream and we are standing in it today” and cited how a local farmer contacted him, asked him for his bank account details and deposited “a significant quantity of money – no questions asked”. The design and build of Coolamon Cheese is studded with local memorabilia donated by people in the area. Homage to the dairy industry is everywhere with pieces of equipment placed throughout the building. The major restoration was undertaken by local builder, Justin Tokely, who engaged other craftspeople to create the impressive and huge metal light shades, doorframes and heavy timber doors, and the fit-out of the café and delicatessen. The mix of old pieces in the cleverly restored building juxtapositioned with the shiny stainless steel equipment in the cheese-making area creates a quirky country space with city-slick service and products. The main game is, of course, cheese. 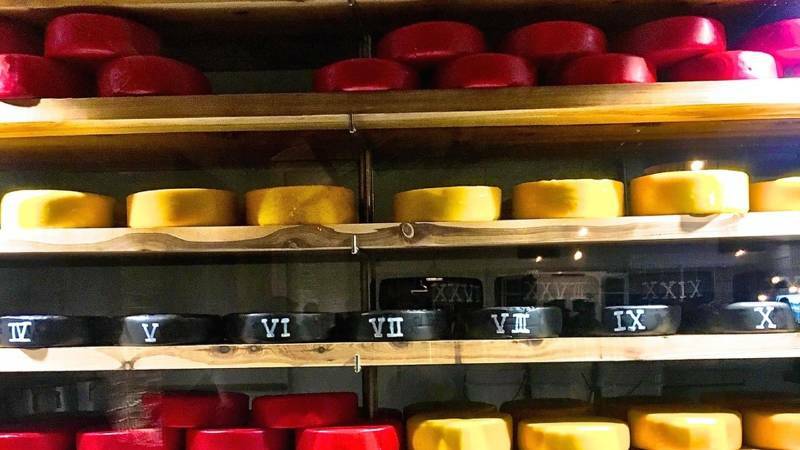 Aged, hard, farmhouse, washed rind, blue, impregnated, cheddar, feta, gouda, white mould and quark are wrapped in coloured waxes, foils, ashes and cloths to enhance their individual characteristics and displayed in large glass-fronted temperature-controlled chambers. The making of the cheeses is in full view of visitors and courses are available. Milk is collected daily from a local dairy farm as the best cheeses are made from the freshest milk. The delicatessen is growing its stocks of locally created high quality foods and products including charceuterie, petit four, confectionary, beverages, preserves and savoury items. The results of a recent survey conducted by Destination NSW indicated the top three priorities of domestic visitors to regional and rural New South Wales are: To eat locally grown foods and meals for breakfast, lunch and dinner; be able to buy these foods to take home, and: to visit the places where these products are grown and/or made. Coolamon Cheese hits the bulls-eye for all three desires. In its first week of trading, the Coolamon Cheese factory, already employing 16 people, has been inundated with thousands of visitors. Stocks of some cheeses have been exhausted and the coffee counter is off the Richter scale. Build it and they will come, as the saying goes, and this little country town has just commenced its renaissance with plenty of personality and full support of the community.